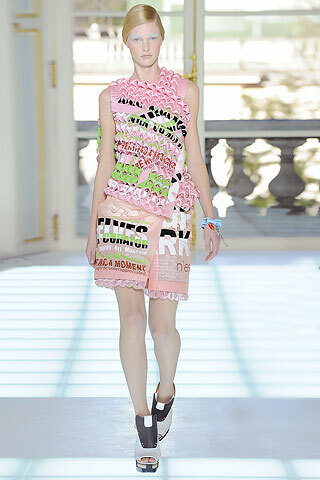 « Billy Idol meets Marie Antoinette » was the theme of the Balenciaga by Nicolas Ghesquière Spring/Summer 2006 Collection. Other Marie Antoinette-influenced collections : ALICE by Temperley Spring/Summer 2011 (modern Marie Antoinettes), Bora Aksu Autumn/Winter 2010-2011 (Marie Antoinette mixed with Tim Burton’s « Edward Scissorhands »), Chanel by Karl Lagerfeld Resort 2013 (presented at Versailles, this collection, which showcased punk-style Marie Antoinettes, was more specifically inspired by Louis XV’s favorite, Madame du Barry), Charles Nolan Autumn/Winter 2008-2009 (Marie Antoinette was the starting point of this collection), Christian Louboutin Spring/Summer 2009 (36 Marie Antoinette-inspired shoes, made in collaboration with Jean-François Lesage), Cushnie et Ochs Resort 2013 (Marie Antoinette mixed with « Ancient Aliens »), Hervé Léger by Max Azria Spring/Summer 2011 (Marie Antoinette and lingerie were the 2 inspirations of this collection), LaQuan Smith Spring/Summer 2011 (influenced by Marie Antoinette and Versailles), Maxime Simoëns Couture Spring/Summer 2011 (« This, Madame, is Versailles » collection, based on Sofia Coppola’s « Marie Antoinette »), Modern(ist) Spring/Summer 2009 (influenced by Marie Antoinette’s decadence and Edith Head’s low-key style), Thakoon Autumn/Winter 2011-2012 (this collection was based on the similarities between the costumes worn at Versailles and the Masai outfits). Cindy Sherman inspired the makeup (by Pat McGrath) of the Balenciaga by Nicolas Ghesquière Autumn/Winter 2010-2011 Show (moreover, the inscription « Cindy Sherman » appeared on one dress, among other collages). Some Cindy Sherman-inspired collections or Cindy Sherman’s collaborations : Balenciaga (6-photograph « Cindy Sherman : Untitled (Balenciaga) series », printed in 2008, and on display in 2010, at the Balenciaga flagship store, in New York), Comme des Garçons Autumn/Winter 1994-1995 (postcard series for the advertising campaign, « Metamorphosis », in collaboration with Cindy Sherman), M.A.C Autumn/Winter 2011-2012 (Cindy Sherman was the face and the photographer of this makeup line), Marc Jacobs Spring/Summer 2005 (the advertising campaign, shot by Juergen Teller, featured Cindy Sherman with Juergen Teller), Peter Som Autumn/Winter 2011-2012 (influenced in part by her « Untitled Film Stills »), Rochas by Marco Zanini Spring/Summer 2012 (inspired in part by her « Untitled Film Stills »).